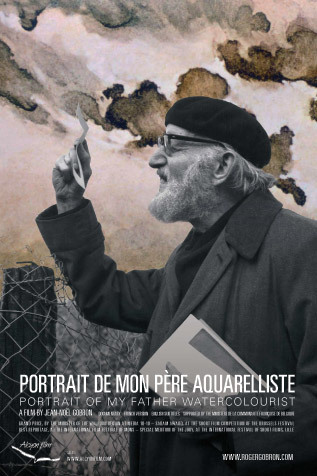 Film: "Portrait of my father watercolourist"
The son of the painter, the independent filmmaker Jean-Noël Gobron, shot this documentary about his father between 1977 and 1985. Thanks to a small subsidy it was finally terminated in 1987. The film attended national and international film festivals and was awarded four times. It was also shown on several television channels and continues to be broadcasted today. 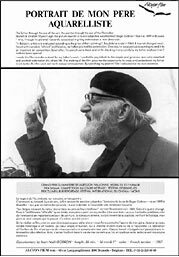 The father through the eye of the son, the painter through the eye of the filmmaker. The picture rewrites in a very subjective way the life of Roger Gobron - born in 1899 in Brussels - who, through his pictorial research, succeeded in giving watercolours a new dimension. "In Belgium, artists are evaluated according to the price of their paintings", Baudelaire wrote in 1864. It has not changed much. Faced with complete "official" indifference, my father painted his watercolours. One day, he wrapped up a painting to send it to an important art competition. Soon after, the parcel came back and while checking it very carefully, my father realized that it had not been opened. I made this film to make a stand for my father's work. I wanted to pay tribute to this simple and generous man who searched and painted watercolours his whole life. The making of the film gave me the opportunity to know and understand my father much better. But this work lead me to deeper introspection. By searching my parents' life I rediscovered my own existence. 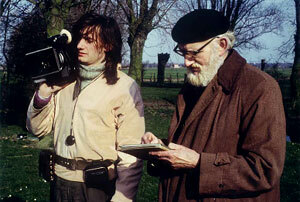 Roger Gobron and his son Jean-Noël in 1980, during the shooting of the film. Postproduction grant from the Belgian Ministry of the French Community. For the complete list of all available documents, please go to the Downloads page. Available on VHS (Pal) & DVD (only the DVD includes the film "Portrait of my mother poet"). Worldwide delivery. Send us an email (see Contact) to order, or to inquire about the shipping charges for your country. Use these links to download the technical sheet in Adobe Acrobat pdf (350 KB) or as zipped jpg (337 KB). Use also Contact to inquire about a video master for television broadcastings, a film copy in 16mm and all other issues concerning the film of Gobron's work.